A criminal who went on the run for six years has been found hanged in Woodhill Prison just 16 days after being recaptured. 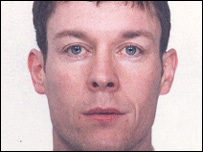 Vincent Palmer, 37, known as the most-wanted fugitive in the Midlands, absconded from Birmingham Crown Court in 1997 after being convicted of conspiracy to rob a post office. He was later sentenced to 13 years imprisonment in his absence. At one point police projected a 60ft-high mugshot of him on the side of their Birmingham headquarters to attract information about his whereabouts. Palmer, who was born in Birmingham, was finally taken back into custody on 6 January in an armed swoop at an associate's house in Shenstone, near Lichfield, Staffordshire. Palmer was also wanted for questioning over the murder of Black Country businessman Martin Sylvester in August 2001. Palmer, known as "Vinny", was discovered by another inmate hanging from a ligature in a shower at the high security prison, near Milton Keynes, in Buckinghamshire, on Thursday afternoon. Officers' attempts to resuscitate him were unsuccessful and he was pronounced dead at 1610 GMT. He had not been on suicide watch. Police and the coroner have been informed. The Prison Service will now carry out an internal inquiry, a spokesman said. It was the eighth jail suicide this year in England and Wales.